This post is in reference to Alert Notice 602. My name is Bert Pablo and I'm the new staff astronomer at the AAVSO. While many have probably heard my name here or there I haven't had much of a chance to interact with you as a group. I'm active in a lot of different projects, but one of my main collaborations before joining the AAVSO (and even now) is the BRITE-constellation project. This is a network of 5 nanosatellites (3 with a red filter and 2 with a blue filter) designed to look continuously (~ 6 months) at the brightest stars (V< 6) in the sky. While it may seem a bit counter-intuitive these stars often have very poor photometric coverage because they are so bright that they saturate very quickly on even small telescopes. As such BRITE has already given us unique insights on several stars that we thought we understood (like this shameless plug for my own research: https://phys.org/news/2017-03-iota-orionis-pulsating-beacon-constellatio...). BRITE does a lot of things well, but it has limitations. For one it was not designed for long term monitoring. It can observe for 6 months at a time, but save for a handful of stars, the observations are not repeated regularly. Additionally, while it observes stably, timescales longer than about a month are tough to disentangle from instrumental variability. These are areas where the AAVSO and it's community of observers excels and as such a collaboration can be very beneficial for the right targets. A perfect place to start is the red supergiant CE Tau. This star has a V mag of ~4.3 and is known to have long scale variations from AAVSO data of ~165 days which is roughly the extent of the BRITE observation and therefore hard for it to track. What's more this object is already a PEP target and has a good time base over the last couple of years already built up, so we are starting from a place of strength. Plus, as the variations in this target are significant (~0.5 magnitude), it is not limited to PEP observers. It is also a superb long term monitoring object for CCD and especially DSLR observers. Since BRITE is handling any short term variability, the goal for the AAVSO community is to get a better picture of the long term variability so 1 observation per night or even every few nights will be more than adequate. It's important to point out that while the project is well defined, the end result is impossible to know. We are embarking on an adventure here, studying an object from a class that is short-lived (from an astronomical standpoint) and not well understood. We are looking at a tiny but crucial snapshot in the life of one of the most massive stars in existence and are hoping to understand just a little bit better what makes it tick, and how it will evolve from this point forward. Instead of calling this a campaign, it may be more apt to call it an expedition as much of this remains a mystery. If you are taking DSLR photometry (or just have a very wide field of view) you are in luck as this particular project takes full advantage of your capabilities. Not too far away (~20 arcminutes) lies another BRITE target V960 Tau. This star is a mystery. It's a Be star that has significant variability that was noted in Hipparcos and ASAS, but little else has ever been done with this. Currently, it has exactly 8 observations in the AID that also don't tell us much. It likely has low level pulsations which BRITE will likely catch, but BE stars can do very strange things some times, and vary wildly in unpredictable ways. This is less likely to be well understood with BRITE as it will be hard to uniquely disentangle. Having multicolor photometry should be quite enlightening. Plus, it will literally be in the same field for DSLR observers and roughly the same magnitude, so getting photometry on this star will just require extracting two stars instead of one. Since there is little idea what to expect it will be a fun adventure to follow. I've just submitted my first DSLR observations of CE Tau. The field of view is about 2.5 by 1.6 degrees with my Canon 600D and ED80 f6 refractor. By placing CE Tau off center I could include the 67 and 68 stars. I chose 68 as the Comp star as its B-V is closer to that of CE Tau, I used 67 as the Check star. I just submitted my first observations of CE Tau in the AAVSO database. The observations were made with CCD and filters B, V, Rc, Ic. This is the first test in a very bad photometrical night. Thanks for your observations. Sorry, I have been traveling pretty much non-stop for the last couple of weeks. I will take a look at the light curves. We will have to see how things are going, but we can refine moving forward. Thanks, for your observations. 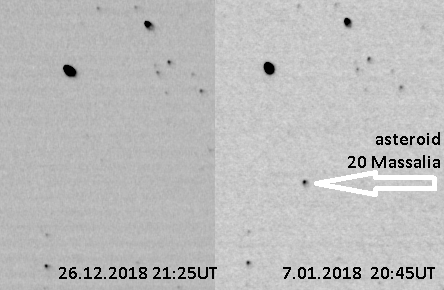 As a fun fact: those who are observing CE Tau with rather wide-field DSLR equipment during the last few weeks might be able to catch the asteroid 20 Massalia in the frames. That ca 140 km in diameter object could be seen passing through Taurus , eg. near 109 Tau lately. 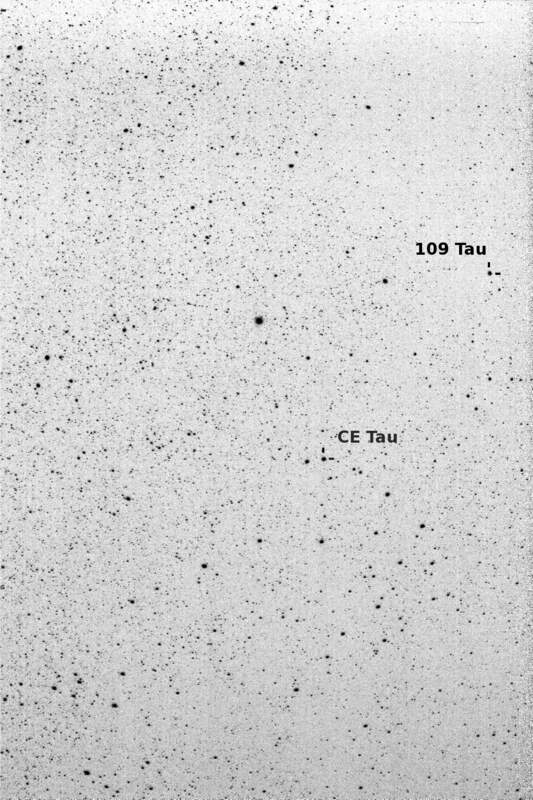 This here is a (stacked and annotated) frame I took on Jan 10th 2018 which shows the positions of CE Tau and 109 Tau. This animation shows how 20 Massalia passes south of 109 Tau in three frames taken between the 8th and 14th of Jan 2018. Its brightness is around 9.0 mag in V.
This was taken with a Canon EOS 1100D and smc Pentax-M 85mm 1:2 legacy lens, a stack of 25 x 4 seconds exposure. More to the point, after a long period of bad weather I think I took some useful data which I still have to reduce, I hope to begin to submit measurements soon. Up is north, right is west. Remarks on last observations of CE Tau and V960 Tau in AAVSO db. I've also found asteroid 20 Massalia near the edge of photos taken on 7th of January 2018 with brightness ~8,9V (north is on the left and west - up). For example we've made observations of CE Tau on the same night of 7/8 Jan 2018r: BRIA - TG=4,314/4,305 mag; EHBA - transformed ensemble V=4,262 mag. Taking into account only the colour difference (B-V)~0,5 mag between comp 58 and CE Tau for my standardized TG photometry gives ~0,05 mag correction, when transformed do Johnson-V. But in this way I would neglect differential atmospheric extinction, which are important for CE Tau and comp "58" (air masses for the moment of observation respectively for CE Tau / comp "58" - 1,231 /1,249; in my place CE Tau always has an air mass > 1,2). So maybe it is a better idea to take closer (~20' from the var), but fainter "68" as comp star and make standardized / transformed to V photometry. Alternative way is to make ensemble V photometry as Heinz-Bernd. As Mark Blackford showed in the last DSLR manual v.1.4, for "normal" variable stars, i.e. a cepheid, even the transformation of TB,TG,TR --> BVRc is possible, but CE Tau is not normal - (B-V)~+2,07 mag, continuum contaminated by countless TiO absorptions. I am interested in reporting to AAVSO three colours DSLR photometry of CE Tau. I see a problem with this extremely red supergiant. I think that the observers should use the same comparison star or a star with a similar color index to avoid up to 0,9 mag difference in the same DSLR filter! Please look at the attached light curve of CE Tau generated by the AAVSO LCG with data up to 23 of January 2018. 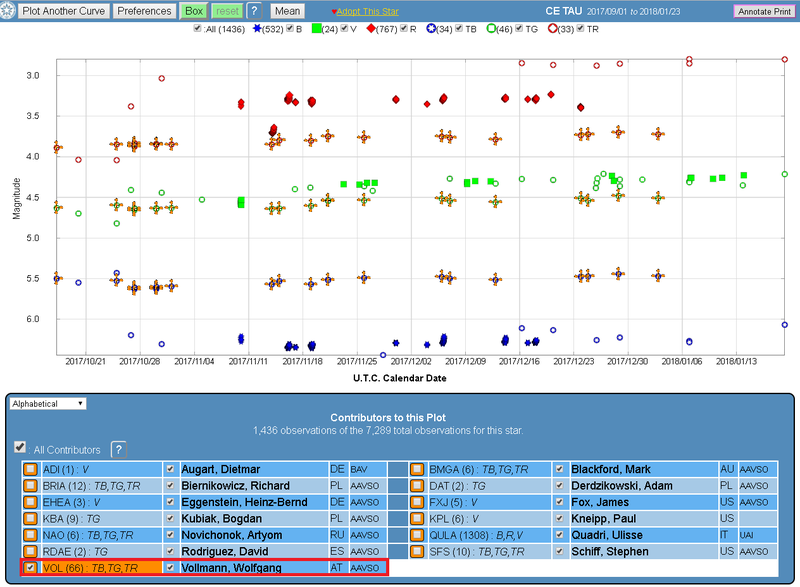 There were marked with a cross very good and consistent 66 observations in TG,TB,TR filters made by Wolfgang Wollmann (obs.code VOL), who took a very blue comp "54" (B-V)~-0,096 mag). On the other hand, most of the observers have taken very red comp star "58" (BBJ-363) or "68" (BML-454). Some of them (BMGA, SFS, me - i.e. BRIA) reported observation in three coulors TG,TB,TR. For instance, between Christmas and New Year in filter TR our target CE Tau was ~0,9 mag brighter in my observations (BRIA) in comparison with VOL's data (~2,9 vs ~3,7 mag) . The TG standardized photometry based on red comps gets CE Tau ~0,2 mag brighter in comparison with blue comp. It is understandable that if we take the transformation coefficient TG --> Johnson-V for typical DSLR camera of order of Tv_bv ~ -0,11 - -0,14 (Tv_bv - see AAVSO DSLR manual v.1.4) and difference in colour index B-V ~ 1,6 mag between blue and red comparison stars. In comparison the picture shows a std astronomical photometry BVR made using CCD (over a 1300 untransformed QULA's observations mainly in B and Rc ) and PEP (observer: FXJ, transformed V! ), and a few DSLR "V" (observers: EHEA and ADI). 2. Comparison star(s) for standardized DSLR photometry TG,TB,TR of V960 Tau. The same problem of comp star also deals with the observations of V960 Tau (see attached view from the AAVSO LCG). Here, an observer SFS reported TG,TB,TR photometry using very red comp star "58" and got magnitudes of V960 Tau systematically brighter ~0,1-0,2mag in TG, fainter ~0,8mag in TB and brighter ~0,9mag in TR, than observers, who used blue comps like "54" or "55" (obs. VOL, BMGA, BRIA). 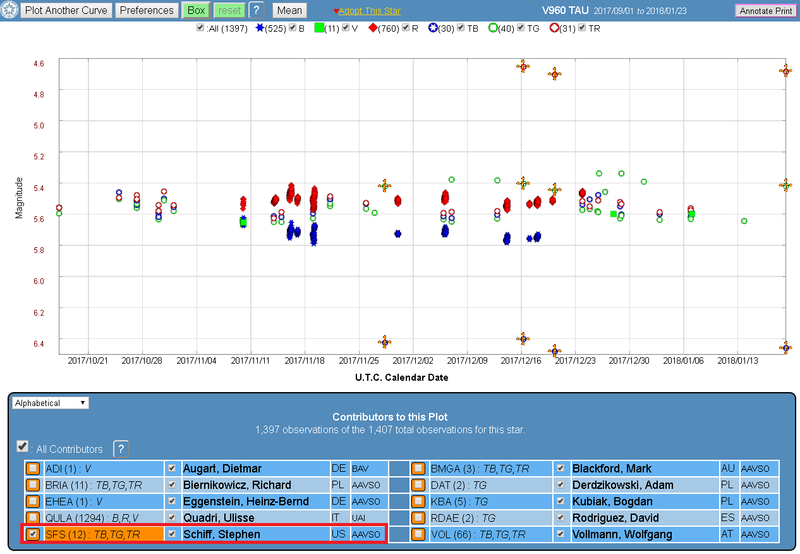 Also observer KBA reported only TG photometry using a very red comp star "68". Observers, who used "blue" comps for V960 Tau, reported results within ~<0,2mag range between extreme values of TG,TB,TR photometry for the same moment. 3. Catalogue values for Rc brighness. I've also attached my current table of catalogue brightness of comparison stars ("58" for CE Tau, "54" for V960 Tau), and check stars ("68" for CE Tau, "67" for V960 Tau), and approximate (mean) values for both variables. Very red "58" (117 Tau, BBJ-363) was used with success by R. Wasatonic and E. Guinan as a comparison star for PEP photometry in two observational seasons 1996-97 and 1997-98 (see IBVS circ. no 4629 - url=http://www.konkoly.hu/cgi-bin/IBVSpdf?4629). I've taken all values from GCPD because here I also found Rc catalogue brightness for TR standardized photometry. Maybe it would be better to take catalogue B,V values from table generated by VSP, and Rc from GCPD - I didin't check (?). 4. Better accurancy for TB and TR standardized photometry. I use old lenses 85mm F/2.8, 200mm F/3.5, 300mm F/4 for DSLR photometry, sometimes on EQ3-2 polar mount with motorized RA axis. I will have to think about some better optics (?). In good weather conditions, only for TG or DSLR transformed Johnson-V, usually I get std dev 0,01-0,02 mag. Due to chromatic abberation, with my current lens F=85mm, even closed to F/4 (+30sec exp on EQ3-2 following the sky), I have to make photometry of CE Tau with radius of measuring aperture 8 pixels in TB colour, 10 pixels - in TG and 12 pixels in TR. It is very difficult with such a lens to defocus bright stars in all three DLSR colours to get satisfactory accurancy (say, std. dev. < 0,05 mag). I'm the one who has been using the very red 58 comp star. Somehow I thought that would be the best thing to do, because of the stars listed it is the one that is nearest spectrally to CE Tau (Class M2lb; B-V = 2.06 per Guide9). What are you suggesting I do? Personally, I am deeply suspicious of any attempt to make R measurements with a DSLR, for the simple reason that the spectral bandpass of the typical camera filter is so broad, and so poorly matched to any of the standard filters used for photometry. Thus I am completely skeptical about plugging Rb values into the spreadsheet. The other thing I do not like about the untransformed measurements is that (at least for the software I have) there are no extinction corrections applied; and we all know that the atmosphere favors the red part of the spectrum. I think if I do any more measurements, I'll go Heinz' way and use an ensemble. Addendum: After rereading your post, I realize the above is incorrect - you were referring to the measurements of V960. I agree, I should have used the 67 as a comp, as it is much bluer. I will redo the V960 measurements, delete the prior sets and replace them. But not tonight. I share much of the same frustrations, the red color of CE Tau is definitely a challenge. There's also a bit more to worry about: 117 Tau, the "58" comp star that others have used and that I included in my ensemble as well....is actually listed as a suspected variable, NSV 16312. According to VSX, the suspected variation is 5.85 - 5.88 Hp , so maybe it's ok to use it in an ensemble for DSLR photometry (I also get (statistical, one sigma) uncertainties of around 0.02 mag in V). But maybe observers don't want to use it as their only comp star for high precision photometry. Even worse is a "55" comp star 000-BBJ-530 in this field, which happens to be NSV 16329, with a suspected variation (source: VSX) of 5.48 - 5.71 K (!!!! , no idea what that would mean in V or B, tho). I had this one in my ensemble at first, but it stood out as an outlier, so I instead included it as a third target to observe in addition to V960 Tau and CE Tau. I have ignored differential atmospheric extinction so far, but yes, that's a valid point. I have only reported V measurements, but for the transform from TG to V , I obviously need a color, which I get from correlating the measured (TB-TG) values with the catalog (B-V) values of the ensemble stars and then using that (linear) model to get a B-V of the variables. So far that seems to work ok-ish. The statistical variation of the transformed B magnitude measured this way for me is more like 0.03 mag, so not too impressive, but for providing the color for the transformation correction term (with a transformation coefficient typically around 0.1), that should be acceptable). I did not use the 55 because per VizieR it is actually a double, TYC 1301 1941 1 and 1301 1942 1, with 9.77 arc sec separation. Both stars are late class B, and both have absolute magnitudes in the +1 to +3 range (using Gaia parallax data). I suspect that the luminosity class assigned using previous measurements is wrong, and so the standard MMJ formula for converting Tycho magnitudes to Johnson-Cousins ones may be inapplicable. Thus I did not include it as a candidate. Thanks a lot for all of your hard work thus far. This thread has been really active recently which is reigniting my excitement for this project. I realize that CE Tau is a challenging star because it is a red supergiant, which means that virtually nothing will be as red except other RSGs and they are few and far between. Also, all RSGs have significant variation, so there really is nothing that can be done. However, because of this the relationship between TB, TR and TG should be very interesting. If it helps, I do want to remind you that I don't care about the transformed magnitudes and am happy with the DSLR filters as is. TR in particular is too different from the Rc filter for the transformation to mean much. As a side note, My hope in the future is to make the DSLR filters more mainstream. If these filters are analyzed and added to the bigger software packages, then it will be easier to take data in them and you don't have to worry about the errors inherent in transforming to a different filter. I realize that there may be extinction issues, however, having the data and analysing it is the only way to know how useful it will be. Since there is a decent amount of data now, I think there is enough to start doing a cursory analysis. I'll keep you updated. I wish I could give you more insight into the which comps would be ideal, but my guess is that all of them have some issue. Thanks again for your observations, and don't hesitate to ask if you have any specific questions, that you think I might be able to answer. Regretfully I have not been able to observe a lot CE Tau due to the very bad weather we are experiencing for near two months here in western Europe. I have only eight observation sessions I will soon report after some more checking. Bert I am surprised by that idea to push a TG (and TB TR) standard ? To do so we would need a comparison catalog that supports such standard. For me using V as the reference for TG is questionnable. It's true the VT filter response of Tycho-2 is very near such of Canon's DSLR. We had discussions in the past about that but with little sucess if I remember well. Who uses (untransformed) VT now ? From now near 10 years of experience with it I can say it's much more effective than the transform, much less problems with very red stars and in general star having spectra far from black body. Another interesting point with DSLR (or hybrid !) is the fact the B and G flux measurments are strictly simultaneous, by the way their ratio B/G is less affected by the sky variability. B/G flux and a few normalisation and log just gives B-V. It works very well. We could get B from it (what I do) but it would be better I think to be able to directly report such B-V, not affected by the V variability under difficult condition. It's obvious the same can be done for V-R but seems less of use. I guess the stars relevant for this campaign (variable and comp) are in a range where the Tycho2 catalog would be useful, so I think it would actually be worth to just test this idea of using untransformed TG values but using a zeropoint from VT rather than V. I would think that one could compare the spread of final TG values derived with different comp stars, and using either V or VT zeropoints. Right? Hi Heinz-Bernd, I am just doing a test of it after extracting the VT data from Vizier. I am using a large ensemble of 12 stars, the same stars than I got from Vsp. In my first observation session ( 4 times 5 images ) I got one star with a very large error, eliminated it, others 11 VT have a much smaller overall scatter of the ensemble than with Vsp: +/- 20 mmg peak/peak (mostly due to one star, possibly a blending) instead +/- 50 mmg with Vsp V mag. The individual sigma of each star is typically 0.002~0.003. I used small coef for the VSF correction to balance the color (0.05 -0.08) for VT instead of (0.3 -0.33) for V Johnson. It's clear we have much less color problem with VT and a more reliable catalog at least for this class of magnitude. I am continuing to generate various test. After looking for some time at my data and processes, I am unable to find a reason for the discrepancies in my untransformed measurements. I suspect the data in the original VSP table (the one with the Rc values) are contributing to the problem, but even 100 mmag errors do not explain the wild variations in my results. I have concluded that making 3-color untransformed DSLR measurements is not my cup of tea. To aid in perhaps unraveling the problem I processed last night's data using two methods, and in the case of V960, with two different comp stars for the untransformed measurements. It is clear to me that for V960 anyway, the transfomed V measurement has the greatest chance of being representative of an actual magnitude, though the B looks pretty reasonable too. After spending a couple of hours on VizieR, looking at SeqPlot tables, and doing my own Tycho to Johnson conversions, I came to the conclusion that for my purposes the best thing to do would be to use Tycho derived data, so that's what I did for the ensemble measurements. The attached .pdf file lists them all. Kindly ignore the error figures; they are almost certainly inflated by a factor of two or more. As expected I have completed my extended testing of process based on Tycho 2 VT compared to Vj from Vsp. Originally I started with 14 comparisons, two were blended and eliminated, then using the Tycho 2 "proximity" indicator and its "CCDM" flag I found four more of the comp having some blending problem. Using only the 8 remainging reduced a lot the internal scatter of the ensemble. Six rejects on 14 comparisons is a lot but this is typical from the problem we have when using short focal lens ( here 100 mm ) and defocus, a problem never anticipated in Vsp. Then I have restared my processing following 1) the TG definition, 2) classical transform, 3) my VSF technique. And this for both Vsp Johnson's V and B-V and then VT and BT-VT from Tycho 2 (VT replacing TG). The results are in the two attached documents. The graph is a tool I use to check the ensemble, the lines follow the mean of each observation session made from several short series, the marks are the results of each series. The colors are linked to the stars B-V .Delta-mag are the differences from the catalog. Ideally the ensemble should be a single straight line, then shift, skew, oscillations... are indicators of various errors and help to eliminate improper comps or change parameters. In the case of Vsp/TG (top right) the color error is obvious, very large, it's clear the target result is severely affected. In next below, the transform improves a lot the internal scatter of the ensemble but it remains heigh even if the red stars are well at the mean level of blue ones. Further below the VSF improves a lot more, resulting in an acceptable scatter into the ensemble. On left are the same curves using Tycho 2 VT and BT-VT for the transformation. The improvement is obvious. Even the top case where no corrections are applied achieves an internal scatter of the ensemble as good as the best for Vj and VSF. The catalog is much more coherent in case of bright stars and it offers additional useful information for selecting comparisons. The second document is a table showing the results in numbers. The sigma of each series is nearly the same in all cases, only due to noise and sky condition. What is very depending the catalog and process being used are the "delta", the internal scatter of the ensemble. 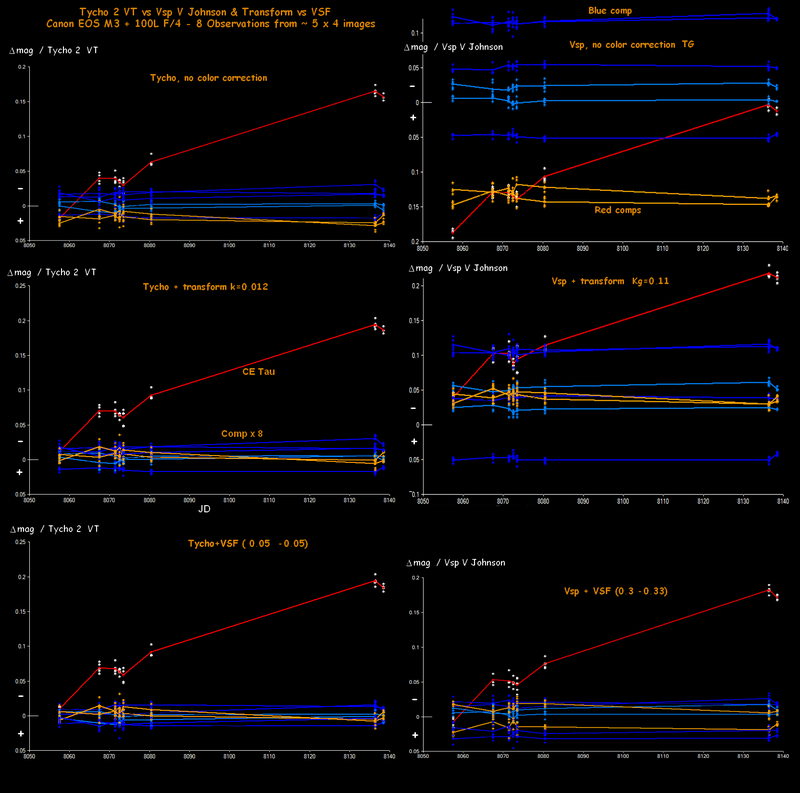 Clearly Tycho VT results are far better in particular when processed with VSF. I would like a lot having the possibility to report directly VT and BT-VT in case of large field DSLR photometry. It's a much simpler process for beginners without color correction, providing good results. Then others can apply corrections providing accurate results, including in case of difficult stars like very red or having non-regular spectra. I have read your article, but I find it hard to understand, how to proceed with your VSF procedure? What do you recommend for comparison star and check star? How do you proceed to the transformed V magnitude, following the VSF-procedure? It is obvious, that repeated observations improve the accuracy, but the difficult problem is to calculate the first example with good ideas. I have the impression, that your article on DSLR photometry contain good ideas, but they are hard to understand (for me). The magnitudes in the example are negative, because they are measured with respect to the (very faint) star with 1 ADU. The first observation (-11.300mag) has thus an intensity of 33113 ADU in an 8 pixel aperture (FWHM =4 pixel). The two observations in green are mentioned separately, because the difference (g1-g2) is a fine measure of the quality of the observation. Here 0.006 mag, but other observations in the same run gives greater values up to 0.050 mag. EOS550D 20 sec f=200mm and f/8 for the observation. thanks for your interest in VSF. The application is very simple in fact, what is more work is the calibration of the DSLR, like for a classical transform. This afternoon the link was broken at JAAVSO level, no access to JAAVSO at all. Now it's back. Fv being the V johnson flux (not mag), Fg is the mean of the two G layers. a and b are to be calibrated for each DSLR type, the optics could have an impact too but very limited in general. The a & b coefficients should be determined at AM=1 , near zenith. That technique is well self-adaptive to the air-mass (through the linked blue channel count), the same a & b set can be used down to AM 2~2.5 . At high AM a correction should apply (like in classical transform). Sorry I have no 550D at hand, the coefficients for my EOS M3 are a=0.3 and b= 0.33 . Normally the response curves of the Canon filters have not significantly changed since the 450D but the gains of the channels are somewhat different from one EOS model to the next. The "a" coefficient is not very sensitive, the "b" is more. In fact there are "family" of coefficients that work well but being more or less self-adaptive to AM. You can start with those values and probably have to reduce somewhat the a & b for a 550D but not below 0.25. It should be made near AM=1 using a set of stars having a B-V distributed from blue to red ( -0.2 ~ 1.2 ). Late M type stars shall be excluded as any stars having a specific spectrum. This is similar to what we do for the classical transformation. Then a mean square technique is used to find the a & b coefficients that minimize the errors across that color range. CE Tau, "68" , "67a"
Using the 67 as the reference I get 68 at 6.766 with a = 0.25 and b = 0.255 (We need more than 2 stars in fact, normally 6~10, then I choose to have a & b about the same, it's usually ok).Those numbers are not surprising to me as they are very near the coefficients of my past 450D. I asked Bert (the PI on this campaign) and he said that as BRITE is no longer observing CE Tau, the campaign is therefore officially concluded. There is not an urgent need for continuing observations, but they would be welcome. I kept CE Tau in the Alerts Tool list but took off the 'high priority' flag.